A former Middlesbrough and Manchester United footballer has a new goal of inspiring Teesside children by taking on a gruelling 280-mile run from Teesside to London. Steve Newham, who played youth football for both Middlesbrough and United, aims to raise up to £10,000 in sponsorship by running 40 miles a day for a week. The money he raises will help fund a once-in-a-lifetime performance at Southbank Centre’s Royal Festival Hall in London by more than 100 pupils from three primary schools within Tees Valley Education Trust. Steve, 37, wants to ensure disadvantaged children from Middlesbrough’s Pennyman and Brambles primary academies and Dormanstown Primary Academy near Redcar don’t miss out on the big day due to lack of funds. Setting off on the morning of Monday June 4 amid cheers from pupils, Steve will run the equivalent of nearly 12 marathons over the next seven days before being greeted by the pupils at the London Eye on the eve of their big performance. Steve, who is sports lead at Pennyman, hopes to inspire pupils from across the three schools whilst raising funds that will help 107 of them fulfil their dreams of performing at the Royal Festival Hall. A former Northern League player with Bishop Auckland, Seaham Red Star, Stokesley and Norton, the Middlesbrough-born fitness enthusiast will be joined on the first few miles of the run by his friend, international athlete Matty Hynes. And Steve will be supported throughout the run by Herbalife products supplied by distributer and wellness coach Gemma Lee, who will travel with him by car. As part of the fundraising drive, more than 1,000 of Tees Valley Education’s children will run a mile each around the school playing fields during the week that Steve is undertaking his challenge. Steve said: “I’ve always kept myself in shape but without doubt this is the biggest challenge I’ve ever undertaken. I’d be kidding myself if I didn’t recognise it will be a big test physically and mentally. “Being greeted by the children in London is what will keep me going. I may just collapse in a heap and it might be emotional. “Having grown up in the Grove Hill area of Middlesbrough, I understand the sort of challenges many of the Tees Valley Education children have. “Some of them have never been outside of the town, so performing at such a prestigious London venue will be massive for them. Kate Barkley, head teacher at Pennyman Academy, said: “We talk regularly to the children about raising their aspirations and building resilience – and what better way to inspire them to do just that by seeing someone they know and respect achieving something like this? On Monday June 11, the Tees Valley Education pupils will join forces with over 200 children from Teesside’s Galileo Trust and other local primary academies plus more than 80 children from London schools to perform. Performing songs about Teesside’s heritage - specially written for the performance by Pete Churchill from the Royal Academy of Music and Adam Dennis from the Guildhall School of Music and Drama - the children will be backed by a 25-piece band featuring musicians from the TV’s Strictly Come Dancing band and the St Nicholas Choir. They have worked with a team of talented musicians to learn and rehearse the songs over the past 12 months. 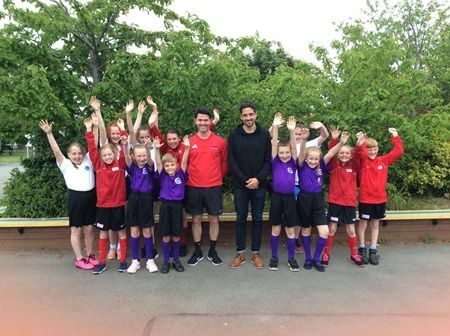 International runner Matty Hynes (centre right) will join Steve Newham for the first few miles of his 280-mile run from Middlesbrough to London to fund a performance at the Royal Festival Hall by primary schoolchildren from Tees Valley Education.